The event will feature all four categories in the NHRA Mello Yello Drag Racing Series including the 10,000-horsepower, nitro-fueled Top Fuel dragster and Funny Car classes, along with the Pro Stock, and Pro Stock Motorcycle. The weekend will also feature the NHRA Lucas Oil Drag Racing Series as well as the E3 Spark Plugs NHRA Pro Mod Drag Racing Series presented by J&A Service. The weekend will also honor iconic figures of the sport as NHRA continues the Legends Tour, which takes place at events across the country. Many NHRA dignitaries will be in attendance to greet fans and take part in the weekend. To purchase general-admission or reserved seats, call 800-884-NHRA (6472). Kids 12 and under are free in general admission areas with a paid adult. All students can save 50 percent on general admission at the gate with a student ID. Military and first responders can save 20 percent on general admission and reserved tickets. 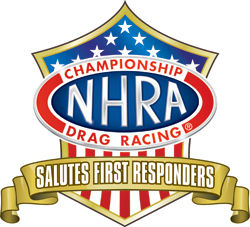 As part of the tribute, first responders will be eligible for discounted tickets to the Virginia NHRA Nationals through GovX. Click here to purchase. Virginia NHRA Nationals Super Comp winner Jeg Coughlin Jr.
2018 Virginia Nationals Super Comp winner Jeg Coughlin Jr.